Artistes from across the country will be performing at the Ganesh Utsav in the city from September 5. A brilliant line-up of skilled artistes, vibrant colours of festivity and a variety of lip-smacking food – this year’s Bengaluru Ganesh Utsava promises to be an action-packed one. From Shaan’s melodies to Bappi Lahiri’s music, namma ooru will get a taste of a range of harmonies as several singers descend upon the stage to captivate our city. The event, he says is created to encourage live music in the city. 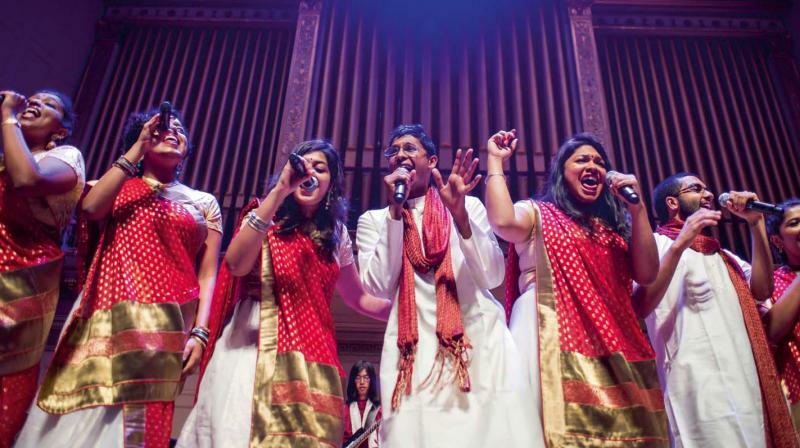 The festival’s itinerary includes performances by Indian Idol Junior winner Anjana Padmanabhan and Akshat Singh of India’s Got Talent fame. There’s also a tribute to the legendary S. Janaki by an all-women band and a one-of-its-kind drum jam by four artistes. This year too, the mantap at the venue has been given a distinctive traditional look. “The mantap is based on the famous Kalyani Temple in Melkote. We’ve built a massive structure which will be the main attraction,” reveals Nandish. As for food connoisseurs, this event will give them an opportunity to dig into some of Karnataka’s scrumptious treats. “We’re bringing together several delicacies from the state including joladha roti, sabudana vada, kotte kadabu, Mangalore buns, halubai and wheat dosa,” shares Nandish. Singer Vijay Pakash is one of the performers who will be crooning for Bengaluru’s audience on September 14. “I feel so blessed that Ganesha has given me this wonderful opportunity to perform for him and his devotees. BGU is a platform where every artiste gets a lot of creative satisfaction, so I’m very excited about it. Every year, I try my best to give something new in terms of the presentation. This time, I have ace percussionist Taufeed Qureshi who will be performing with me. Being the brother of Ustad Zakir Hussain, he comes from a musically rich family. He was gracious enough to accept my invitation,” says Vijay, who will be rendering his latest Kannada hits at the concert. “I will also be doing a medley of Sudeep’s songs,” adds the singer, who has recently crooned for Kotigobba 2 and will be singing more melodies in Kannada films in the future. The 54th Bengaluru Ganesh Utsava will be held between September 5 to 15 at the National College Grounds in Basavanagudi.